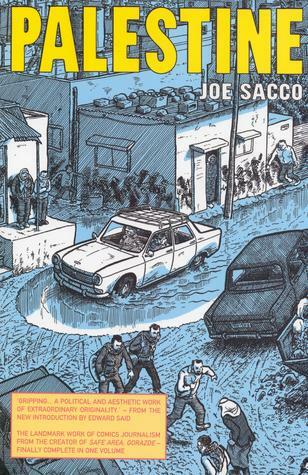 Ever since I came across Joe Sacco's 'Palestine', a graphic novel I borrowed from my friend Hannah, I have been in awe of the ability of Sacco to translate in pictures the struggle of Palestine. I took my time to read the novel, dipping in and out of its pages when I felt I had the time and energy to confront the situation in Palestine. As a medium I find the graphic novel impressive, as it not only has words (and quotes of real life people due to 'Palestines' nature as a documentation of experiences), but it shows faces and families and street scenes, bringing it all to the present because its not only engaging us through text, but also by the intense pictures allowing each page to come to life. I finished reading Palestine a week before my trip to the West Bank. And I am so glad of this timing, for i can honestly say, hand on heart, that Sacco's representation of Palestine is completely accurate, even today. He argues himself in footnotes that the struggle is timeless, as it has no conclusion, no outcome. It is continuous. The way in which he describes his experience of being a journalist within the daily naturalization of violence and suffering, until you realise every family has a story, every son has a brother in prison, every mother has lost a son or nephew to the struggle, the nature of every story and the changing reaction of the listener is documented so perfectly in Sacco's book. It becomes 'normal' to hear of martyrs and settler attacks and imprisonment without reason. For Christmas this year I received Sacco's most recent work 'Footnotes from Gaza'. Ironically I also gave this graphic novel as a present to the very same friend... And again, I find myself taking my time to work my way through the chapters, as each page deserves attention to the detailed drawings and experiences being discussed scene by scene. but read it for yourself. and if you need more persuasion, here is an article on Al-Jazeera with Sacco himself.